I have been testing Avon shower gels for a while, so I thought I would do a post about all four of them. First, I will talk about the Avon Naturals line. Coconut & Starfruit shower gel has a nice smell, I barely smell coconut, it probably smells more like a starfruit, but I wouldn't know, because I have never tried or smelled starfruit. On the other side, Red Rose & Peach has a much stronger scent, it smells mostly like roses, which I don't like. They both have a nice consistency, not too runny and not too thick and they foam well. They don't nourish the skin, neither do they dry it. You get 200ml in the bottle. 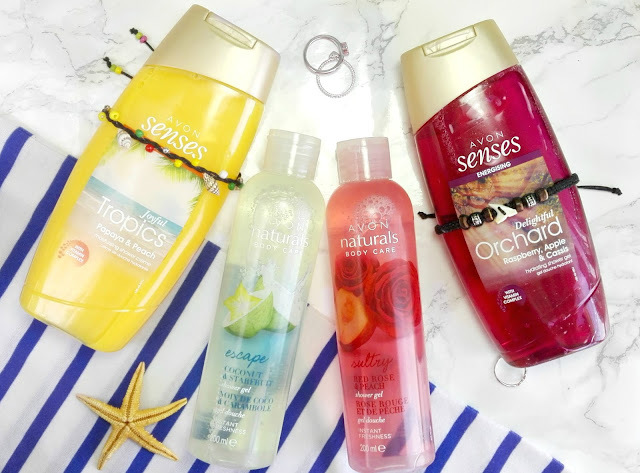 Next are Avon Senses Energising shower gels. Joyful Tropics Papaya & Peach it's a great summery scent, more subtle that the one I'm going to talk next. Delightful Orchard smells mostly like Raspberries, I smell apple and cassis too. It's a strong scent, but I love it. This is probably my favourite out of all four. Both of them have a creamy consistency, that foams very well for my taste. These aren't nourishing either. You get 250ml in the bottle. I only had one problem, they are hard to open, especially with wet hands. My favourite is definitely the Senses Energizing line, I like the design more (despite the cap) and Delightful Orchard it's one of my favourite shower gels right now.